Microsoft .NET Framework version 3.5. It is okay to have other versions of the framework on the computer, but version 3.5 must also be on the computer in addition to any others. Special instructions for users with Office 2010 64-bit installed: see Note 2 below. The Microsoft Access Database Engine 2010 and the Microsoft .Net Framework version 3.5 are free products that can be downloaded from the Microsoft web site. Microsoft Office Access 2007 Data Connectivity Components. Administrator privileges are required in order to install the application. If upgrading from a previous version of CAED, first complete a backup of the database using the Backup/Restore utility before attempting the upgrade. 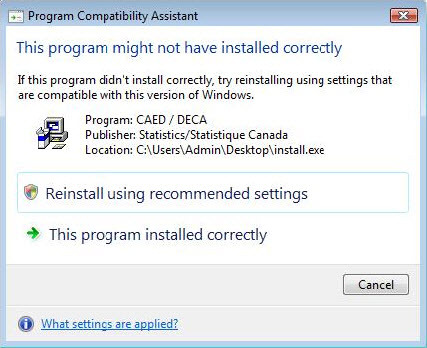 Before starting the installation of the software, you have to decide if you want to use the Canadian Automated Export Declaration (CAED) software from only one PC (stand-alone) or from multiple PC's (LAN) at the same time. 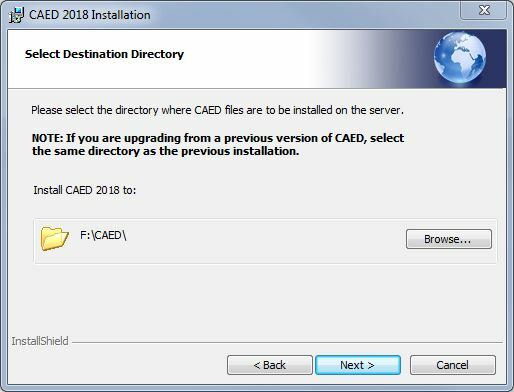 If you are already using a previous version of CAED, you are required to upgrade to the new version. If you have never used CAED before, you have to do an initial installation. 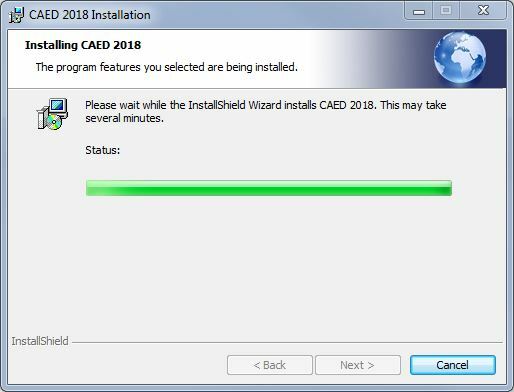 Each of the six ways to install CAED is explained in this document and they all use the installation program (CAED2018_v18.00.exe). 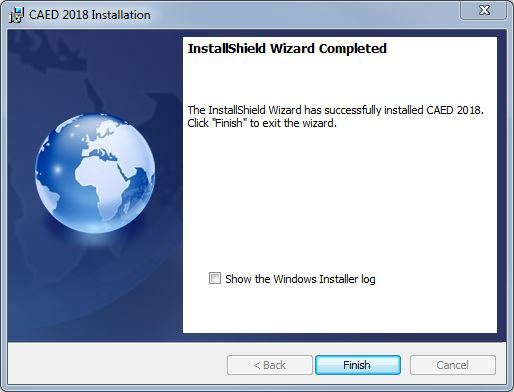 The installation program can be found on the internet at CAED software. Select the type of installation you wish and follow the installation instructions associated with it. 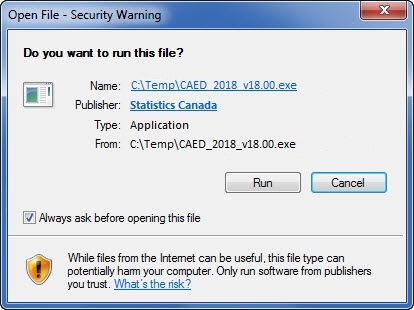 The CAED installation program has been digitally signed by Statistics Canada to confirm its authenticity and prevent tampering. Follow the Single User Setup instructions. See Part 2. In order to retrieve previously saved data, follow the Single User Setup instructions and ensure installation is in the same directory as the previous version. See Part 2. Follow the LAN Version - Server Setup instructions. See Part 3. Follow the LAN Version - Individual Workstation Setup instructions for each workstation. See Part 4. NOTE: In cases where previous versions of CAED were installed on multiple PC's you may only copy one database to the server. Follow the Single User Setup instructions and ensure installaion is in the same directory as the previous version. See Part 2. Backup your database. Follow STEP 1 of the Copy the existing database to the server instructions. See Part 5. Uninstall CAED 2017. See Part 6. Restore your database. Follow STEP 2 of the Copy the existing database to the server instructions. See Part 5. NOTE: In cases where current versions of CAED were installed on multiple PC's you may only copy one database to the server. Follow the LAN Version – Individual Workstation Setup instructions for each workstation. See Part 4. Follow the LAN Version - Server Setup instructions and ensure installation is in the same directory as the previous version. See Part 3. Note: If you are installing CAED on a network drive instead of a local machine drive, then don't follow the Part 2 instructions, follow the Part 3 and Part 4 instructions instead. The Part 3 server installation will have to be done to the network drive of your choice, then the Part 4 workstation installation will have to be done to a local machine drive. Before installing CAED 2018 version 18.00, complete a Backup of your CAED database using the Backup/Restore function in CAED 2017. Consult the "BACKUP PROCEDURE" section in the CAED 2017 User Guide for more information. Using Windows Explorer, locate the install.exe (CD-ROM) or CAED2018_v18.00.exe (Internet download) program and double-click it. The location of the program will depend on if you downloaded it from the Internet or are using the CAED CD-ROM. The first screen displayed will prompt you to select the language for the installation process. Select the directory where you would like to install the program. The default is C:\CAED. 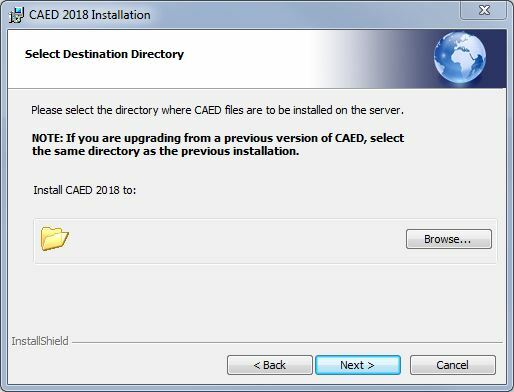 If you are upgrading from a previous version of CAED, select the option "Migrate existing CAED database". 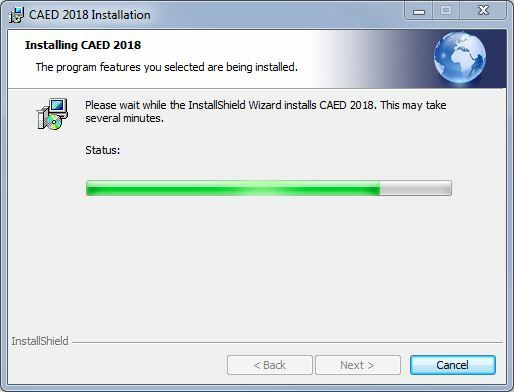 The setup program will then automatically upgrade your existing CAED installation to the latest version in the new default folder C:\CAED or whichever folder you specify. Note: If the migration option is not available, then click on the "Browse…" button and select the directory where your previous CAED software was installed. 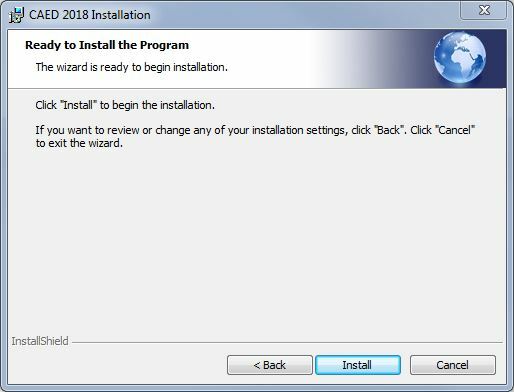 The setup program will then automatically upgrade your existing CAED installation to the latest version in the folder you selected. The program will now install all the files. A box displaying the progress will be displayed. Note: This installation must be done from a workstation that has access to the directory where the application will be installed on the server. Using Window Explorer, locate the install.exe (CD-ROM) or CAED2018_v1800.exe (Internet download) program and double click on it. The location of the program will depend on if you downloaded it from the Internet or are using a CAED CD-ROM. Select LAN Version – Server Setup and then clicking Next. Select the directory where the CAED files are to be installed on the server. Click Browse to select a drive and directory. In the Select Destination Directory screen, select the server drive and directory where you would like to install the server portion of the program. The name of a directory can be typed in, if it doesn't already exist. Click OK when you have completed your selection. You will be returned to the Select Destination Directory screen. Select Next to continue. The program will now install all the files required for the server installation. 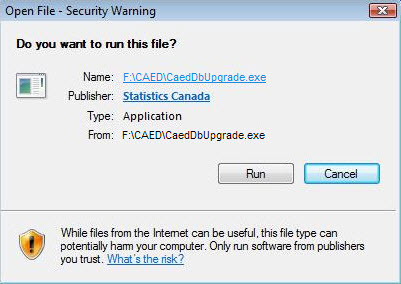 The application "CaedDbUpgrade.exe" is part of the CAED installation program. Using Windows Explorer, navigate to the directory you specified for the "LAN Version – Server Setup". In the example above, the directory would be "F:\CAED". Press the "Start" button, and "CaedDbUpgrade.exe" will execute and update the CAED database to the current version. The window will close when the database upgrade is complete. Wait until the window has closed before proceeding to the next step. 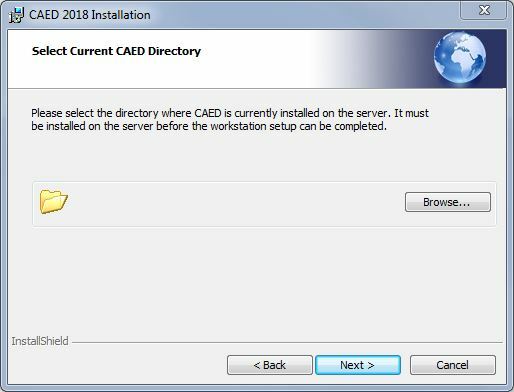 Restart the CAED installation program and select LAN Version – Server Setup. Complete the server setup installation again but this time select "RUN" when the "CaedDbUpgrade.exe" warning appears. Once the application has been installed on your server, it must then be installed on each workstation. Click "This program installed correctly". The installation process must be performed on each workstation following the server installation. The first screen displayed will prompt you to select the language for the installation process. Select the Language of choice and click OK. Select the LAN Version – Individual Workstation Setup by clicking on the circle next to the description and then select Next. Click Browse to select the server location where CAED is installed. Select the location where CAED has been installed on the server. Click OK after making your selection. You will be returned to the Select Current CAED Directory screen. Select Next to continue. The program will now install all the required files on your PC. 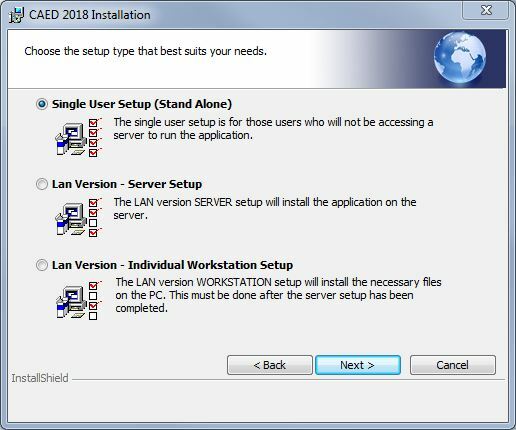 Refer to Part 1, Upgrade from CAED 2017 (or earlier) Stand-Alone to New CAED 2018 LAN Version (steps A and B) if performing this method of installation. 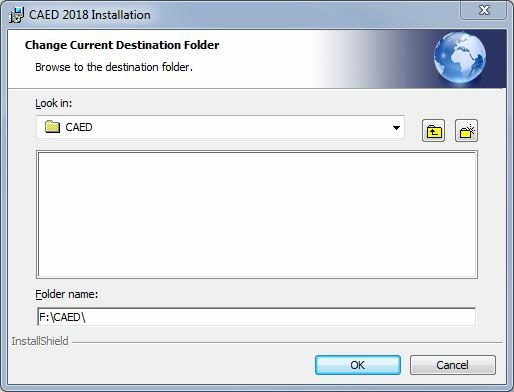 Refer to Part 1, Migrate from CAED 2018 Stand-Alone to New CAED 2018 LAN Version (step A) if performing this method of installation. Refer to Part 1, Upgrade from CAED 2017 (or earlier) Stand-Alone to New CAED 2018 LAN Version (steps C, D, and E) if performing this method of installation. Refer to Part I, Migrate from CAED 2018 Stand-Alone to New CAED 2018 LAN Version (steps B, C, and D) if performing this method of installation. The goal of this section is to move your existing CAED database to the server. Note: In cases where previous versions of CAED were installed on multiple PC's, you can only copy from one PC. Complete a backup of the database using the Backup/Restore utility. This utility can be found by starting the CAED application and looking in the File menu under Backup/Restore. 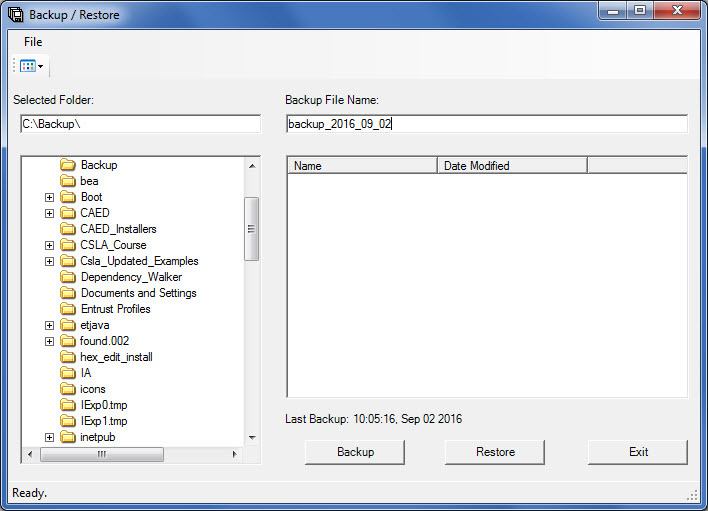 Type in a name for the Backup File Name, then press the Backup button to execute the backup. Below is a screen shot of the Backup/Restore window. Start the CAED application from where it was installed on the server, and under the File menu, click on Backup/Restore. Navigate to the drive and folder where the backup from step 1 was saved, then click on the backup file name in the file list box on the right. Click on the Restore button to restore all of the forms onto the server installation that originally existed on the PC in step 1. Before attempting to uninstall CAED, please ensure that no part of CAED is running or otherwise in use. To uninstall the CAED stand-alone installation, perform the following actions using the workstation where CAED is installed. To uninstall the LAN Version – Individual Workstation, perform the following actions on EACH workstation that has the LAN Version – Individual Workstation Setup installed. To uninstall the LAN Version – Server Setup, perform the following actions on the machine that installed the LAN Version Server Setup. You cannot uninstall the server setup files from any other machine. Note: In all cases, uninstalling CAED will not delete the CAED and CAED DLM databases. These can be manually removed by deleting the installation folder containing the application files. 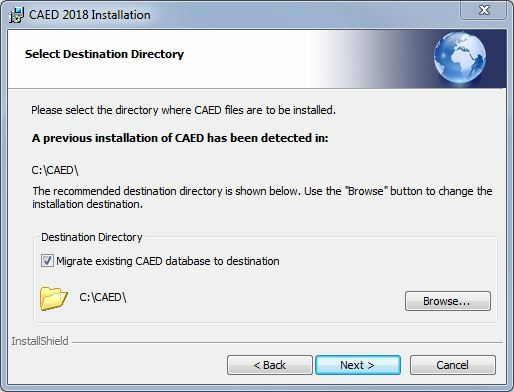 In the event that CAED is accidently deleted, reinstalling the application to the same location will restore the CAED and CAED DLM databases (unless they were manually removed prior to reinstallation). Click the CAED entry from the displayed program list so that it is highlighted. Click the REMOVE button that appears in the highlighted CAED entry. Double click Programs and Features. Click the UNINSTALL button that appears in the toolbar above the program list. Q: When I run the install.exe program in Windows XP or Vista, a message is displayed saying that administrator rights are required. What does this mean? A: You do not have the required permissions to install the application. Log in using their administrator account and install the application. Use the "Run As" service to perform the installation as the administrator without having to log you out. Q: When I click the browse button to select a folder to install CAED, I do not see mapped network drives that are visible in Windows Explorer. How do I install CAED to these locations? A: When the UAC (User Account Control) is enabled in Windows Vista, 7, 8 and 10, you may not see mapped network drives using the CAED installation if those drive mappings were not originally created using an administrative token. When presented with a destination folder dialog, you may enter the UNC path of a network drive in the "Folder Name:" text box. A convention for naming files and other resources beginning with two backslashes (\), indicating that the resource exists on a network computer. UNC names conform to the \\SERVERNAME\SHARENAME syntax, where SERVERNAME is the server's name and SHARENAME is the name of the shared resource. Q: I installed CAED using the stand-alone or LAN Version – Server Setup installation type. 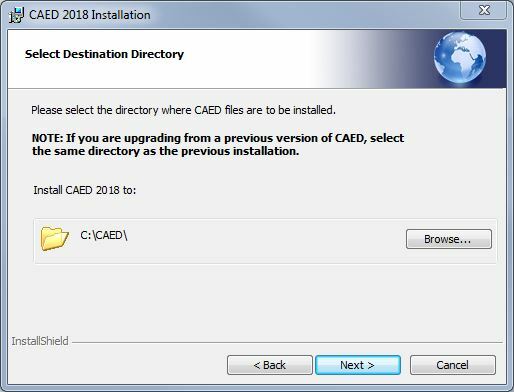 I wish to reinstall the CAED application files to a different location but when I restart the CAED installation, I am not asked to select a destination. A: Once CAED has been installed, the application files cannot be relocated. 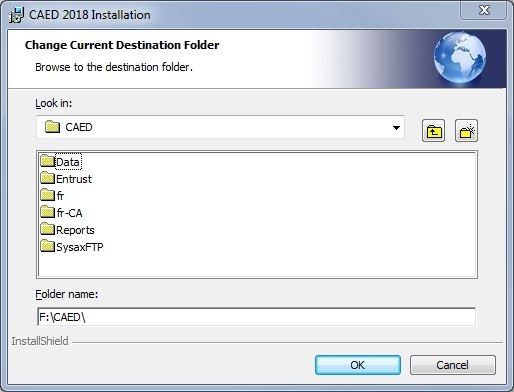 To relocate an existing CAED installation, you must first uninstall CAED (see Part 6) and then perform a new installation to the desired location. 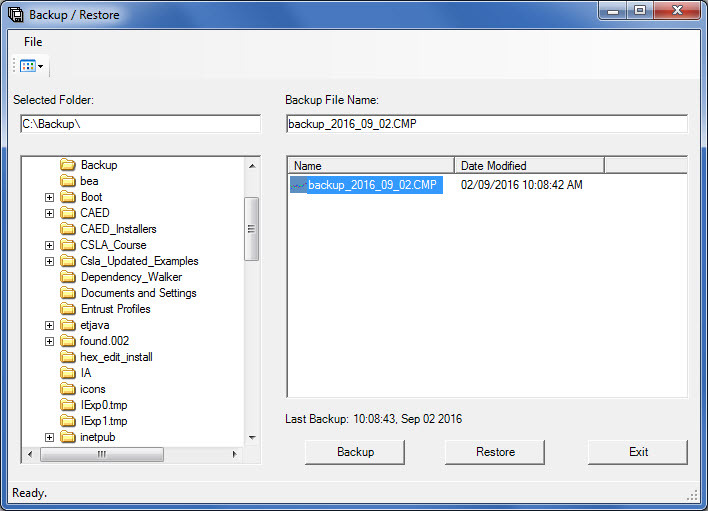 It is recommended that prior to uninstalling CAED, create a backup of the CAED database using the CAED Backup/Restore utility. The CAED database can then be restored using the same utility once the new CAED installation has been completed. If you are uninstalling the LAN Version – Server Setup installation type, you must remember to also uninstall CAED from any workstation that has the LAN Version - Individual Workstation Setup installation. The LAN Version - Individual Workstation Setup must be installed on each workstation after completing the new installation of the CAED LAN Version – Server Setup. HKEY_LOCAL_MACHINE\SOFTWARE\CAED – Must be able to write to this key during installation and read it when running the application.